"Black Dog's Stone Moved to Lakehurst"
by R. B Steece, no date on the letter. "They Were Dependable," Airship Operation World War II, by Rear Admiral C. E. Rosendahl, dated April 1946. The installation of this stone created a great deal of curiosity among many officers and sailors of Airship Squadron Three. Since the men who had known Black Dog were scattered throughout the Navy and only a few remained behind to tell his spectacular story--a story, which is becoming a legend. It all started back in 1944 when a small ugly dog decided to join the Navy. He appeared at Fishers Island, New York, where a detachment of Navy ‘G’ type airships were stationed. Since sailors are inclined to adopt stray dogs, ugly or not, this homeless mutt was taken into the outfit. He was labeled simply, Black Dog. He appeared to be at least five years old at the time although he could have been older, if judged by the many battle scars spread over his body. He also appeared to be a cross between a Boxer and a Chow, because of the boxer square jaw and chow-like black mouth. However, his heredity is pure speculation. To some, Black Dog was just an ugly mismatch from many breeds. He was about the size of a small Boxer or Bulldog. He had short hair, which when clean was black on his head and back and fawn colored on his chest and belly. He walked on four bowed legs and sported a whip-like almost hairless tail. One ear was split and flopped; the other stood erect. His general ragged, scarred appearance was such that it prompted one observer to say that he looked as though he had walked into a turning propeller and survived. A singular thing about him was his independence. No one owned him; he owned the squadron. He displayed a fondness for enlisted men, but was indifferent to officers and chiefs. He was also competent. He knew his way around. He never failed to turn up at the right place for chow, or to get aboard the proper vehicle to be transported to his desired destination. Black Dog’s life at Fishers Island and later at Airship Patrol Squadron 12 in South Weymouth, Massachusetts, is rather vague. The only thing known for sure is that he made occasional airship flights and became an expert Ground Handler. (A ground handler is one who tends the lines of the airship during landings and take-offs. 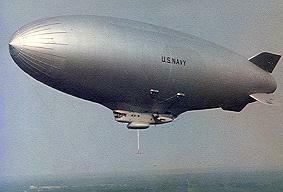 Occasional they literally pull a ‘light’ airship out of the air). Black Dog was always the first to grab the ‘bitter end’ of the line and the last to let go. This was a source of amazement to some and a ‘damn nuisance’ to others. One sailor was overheard threatening to kill that ‘blankety blank’ dog if he tripped over him one more time. However, Black Dog was always there, holding down his end of the line. In summer or winter, in rain or snow, in the day or night Black Dog was there. The end-man on a line could always feel the downward tug of the growling dog. During take-off, when the airship was making its run across the mat, Black Dog would drop his line and run before the ship until it took-off over his back. This action was so regular that a new ‘boot’ in the squadron thought that Black Dog was showing the pilots in the airship the wind directions. Once however, he was hit in the back by an airship wheel before the ship was airborne. It is believed that this was Black Dog’s first trip to the veterinarian. However, it did not stop him from leading the airships across the mat on take-off. He merely swerved to one side from then on, when the ship caught up with him. At the end of World War II Black Dog was transferred to Lakehurst, N.J., along with ZP-l2. ZP-l2 was decommissioned and became ZP-2. They took up residence in dock five, which was to be Black Dog’s home for the next six years. From this time forward the exploits of Black Dog are most accurately recorded. They indicated that he was worthy of all the tales that came with him from South Weymouth. Black Dog spent most of his time in the hangar. The only times he left were to ride the van to the chow hall with the sailors, or when bodily taken away for some reason. He rarely rode the van back to the hangar after chow, but chose to visit his lady friends or fight some officer's dog on his walk back to the squadron. However, he was seldom absent for any great length of time. He usually slept on a coil of line or on a pile of old canvas blower sleeves during the day. At night he liked to hunt rats in the hangar, while patrolling with the security and pressure watches. One night’s escapade resulted in a trip to the hospital. He tackled a big muskrat that came inside from a nearby swampy area to look for food. The rodent grabbed Black Dog by the throat and hung on. The sailor on watch managed to disengage the muskrat from Black Dog’s throat and kill it, but the old boy was hurt. He paid a visit to the vet and got a rabies shot and some penicillin. This was the beginning of the Black Dog hospital fund maintained by the ZP-2 Leading Chief. The men contributed enough so that his future medical expenses night be paid. It ran to $30 or $40 at times. He never failed to delight the men while hunting a rat or a mouse. Sometimes he would get excited and, start running on the slippery floor so fast his legs would be moving but his body would be standing still. It wasn’t unusual for him to run ‘fall tilt’ into a wall in his efforts to catch a rat. Once he was known to sit there for hours waiting for it to come out again. Another peculiarity of his was to chase tins cans, which were thrown for him. He loved to push them over the hangar deck with his nose, and bark at them continuously. It was often necessary to take them away from him to keep him quiet. He was a familiar sight at Personnel Inspection, standing with the Leading Chief or following the Captain through the ranks. Oddly enough, none or this was encouraged by the men. No one ever succeeded or took time to actually teach him anything. He learned things simply on his own, and was accepted by all. He never ‘cottoned’ to any particular chief or man for any length of time, and generally showed complete indifference to those who tried to make up to him. Once in his life, nobody knows when, Black Dog ran under a ‘K’ ship propeller and had the tip of his tail very neatly clipped off. Now most animals would never have gone to a ship after that, but not Black Dog. This meant that he could run under the props any time, now that he was ‘sawed off to size’. He once demonstrated an un-dog-like intelligence by begging a sailor for walnuts, which the sai1or had packed in his lunch pail. Now everybody knows that dogs don’t eat walnuts--that is, except Black Dog. The sailor finally relented and gave the dog a handful of nuts. Surprisingly, Black Dog proceeded to toss the walnuts up in the air and let them crack on the concrete floor, at which time he picked out the meats and ate them. For several years at Lakehurst, Black Dog faithfully manned his duty station for ground handling. He was often seen running ahead of a ship in snow up to his stomach. He was out there when it was so cold he stood on three legs just so he could keep one in the air and not put it on the icy mat. The same principal applied in the summer, when the mat was too hot for his thick paws. Someone took pity on him once and made the mistake of locking him in one of the hangar shops so he could not go out in the cold. He scratched and tore his way through two thicknesses of sheet-rock and sped out to the landing strip. Nobody tried that again. In August of 1951, ZP-2 got orders to go to NAS Glynco, Georgia for duty. As the last ZP-2 airship was crossing the hangar sill to fly south, the radioman from Aircrew 203 climbed out of the ship and grabbed Black Dog and put him aboard. (They had their picture taken then, which can be found in ZP-2’s squadron history in the Bureau of Aeronautics in Washington.) At the beginning of the flight, Black Dog went forward to the radio compartment and lay down under the navigator’s table. Ten hours later when they 1anded at Glynco, Black Dog was still under the Nav table, behaving himself. Before the ship was even on the mooring mast, he was handed down the ladder and turned loose. He then made a ‘bee line’ for the tall green grass and wasn’t seen again until chow time, when he showed up at the mess hall just as though he had always lived there. A few words with the station cooks assured the newly arrived sailors that they would have their mascot properly fed. By this time Black Dog was getting along in years by dog standards. His estimated age was 12 years, which multiplied by seven made him comparable in age to a man of 84. His appearance was the same except be began to lose his teeth. Consequently, he often ended up second best in fights that he started but could not finish. The other dogs were not hurt but gummed in a fight, but Black Dog often went to the vet’s to be patched up after being ripped by a well-toothed, more fortunate canine enemy. One of the sailors took him home one time just to let him rest on a warm rug for a change, and to let him run on soft grass. Black Dog couldn’t stand this easy life for even one night. He ran away. The sai1or finally caught him trying to cross the St. Simons Island Bridge five miles south of Glynco to get back to the squadron. The sailor picked him up and returned to the hangar. It is doubtful that anyone tried that again. One night the ground handling party was lined up on the field in the typical V formation, waiting for an approaching ship to land. Out ahead of the party where the crew would eventually have to run, Black Dog set up a loud yelping and barking. Unable to quiet him, the chief in charge ran over to put a stop to his noisy barking. When he shined his light on Black Dog, there on the mat in front of him lay a six-foot-long, three-and-a-half inch thick water moccasin. Black Dog was enraged with it and it was all the chief could do to call him off before he got bitten. He finally killed the snake and draped it over the bumper of the sand truck, where it over lapped each side by a foot. There wasn’t a sailor in that party who wasn’t grateful to the black mongrel for being there that night. In general, all of these stories are but a prelude to the most spectacular event in Black Dog's life. This even brought him widespread publicity and renown. One night during the hurricane season, the squadron received orders to deploy their airships away from Glynco out of the path of an approaching storm. One by one the airships took off and headed away to their deployment area. In one of the ships, a pilot happened to be using the spotlight in the cockpit to shine its beam on the ground below. It was about three-quarters of an hour after take-off. The pilot noticed that only one short line dangled back toward the airship car instead of the normal two. He shined the spotlight on the nose of the ship and followed the line straight down. There was Black Dog hanging head down from the end of the line. A message was immediately sent back to the base reporting the fact, along with a request to return to base to save the dog. The commander of the squadron, after weighing the situation carefully and considering the anxiety of the squadron personnel, allowed the airship to return to drop Black Dog. The airship returned and made a low pass over the field. A truck with men standing in the rear chased the ship and grabbed the dog in their arms after overtaking the dangling line. When Black Dog was released he had been flying like that for an hour and seventeen minutes, and miraculously, he was still alive. The pads on his free paws and been worn down to the bone where he had scraped them on the gravel mat during the take-off. He seemed more dead than alive. He was rushed immediately to the animal clinic in the hopes that it might not be too late. He stayed there for two months until all his wounds finally healed, before he was returned to the squadron. However, his ground handling days were over. From that time until he died a natural death, he was restricted to the hanger during airship operations. When he died in 1957, the men of ZP-2 felt the loss so much that they donated enough money to buy him that stone mentioned at the beginning of the story. He is laid to rest beside the entrance way into the ZP-2 hanger. In his life, 18 actual years, or 126 dog years, he had been a constant companion and inspiration to the men of lighter-than-air. Many still remember the large barrel-chested, homely, ragged eared mutt who seldom paid you the compliment of licking your hand, but who held the admiration of all. You could not pet him without getting grease on your hand, and yet he was never expelled from the presence of the men he followed, for being dirty. He was a faithful companion to all, and though he lived a long life it was by no means an easy one. When ZP-2 decommissioned in September of 1959, its last captain decided that Black Dog’s stone should be shipped to Lakehurst where the only remaining airships of the Navy were based. The stone was mounted on the ZP-3 quarterdeck along with a picture of this fabulous dog, in order to allow his memory to remain with lighter than air. On 18 November 1959, Commodore F. N. Klein of Airship Wing One, based at NAS Lakehurst, rededicated Black Dog’s head stone in an unveiling ceremony. The unveiling was completed before the personnel of the only two remaining LTA squadrons. Seldom, if ever, has any dog received such memorial recognition.